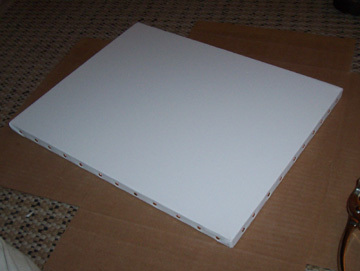 Canvas - Pre gesso'd I have found is the most friendly and is cost effective and consistently good. Cotton is cheapest and good, linen is very expensive and tougher to stretch, but its wonderful to paint on with oils, polyflax is newer and smooth and strong, however it lacks tooth. Cotton is toughest on your brushes, but is good for starters. Wood stretcher bars - I mainly use fredricks, but other brands are similar quality. 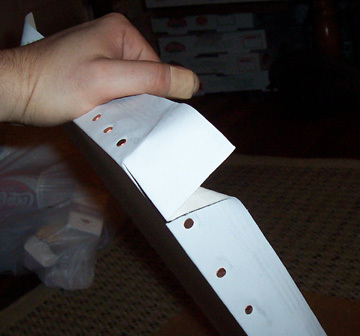 Make sure they are straight and unwarped/bent. The smaller size is really only good for sizes up to 30" without the use of cross support. 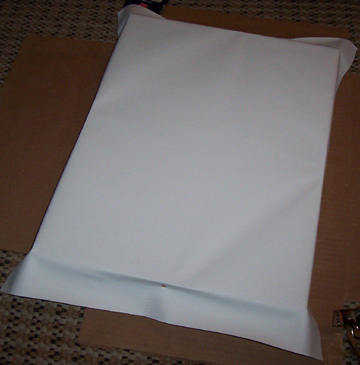 Try to keep consistent with your sizes - 11x14, 16x20, 10x12, 8x10, 12x14, 20x30, 24x30, etc. 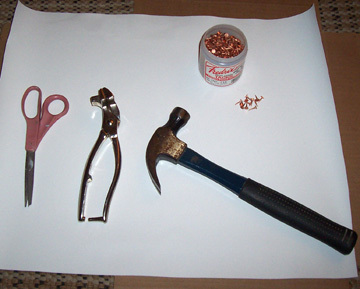 Hammer - any normal hammer will do. I use an old claw variety. Nails - I use the fredricks copper coated ones as they are easiest on the eye to look at and are good quality. If you plan on doing any quantity of stretching I'd recommend buying them in bulk of 1000s. Staplers can also be used, but personally I don't like the site of staples and they might rust badly or cause restretching problems down the road. Canvas Stretching Pliers - Its well worth the $20 investment. 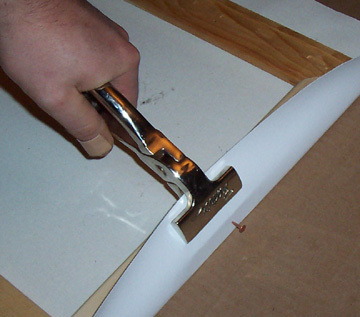 Initially I used large normal pliers and it was very tough on the canvas because of the focused force on a small spot. 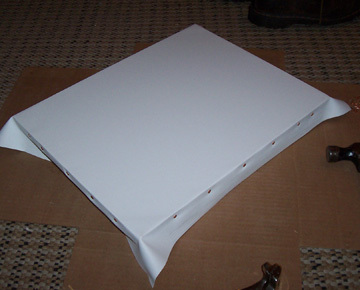 Some type of true 90 degree angle - I use a thin book or folder usually. 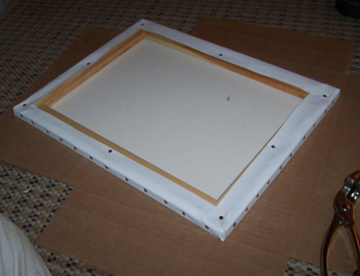 Fit together the 4 pieces of stretcher bars and cut a piece of canvas larger than the finish size. Eyeball the squareness of the stretchers; don't worry about it not being exact at this point. I usually leave about 1.5 - 2 inches over each edge. 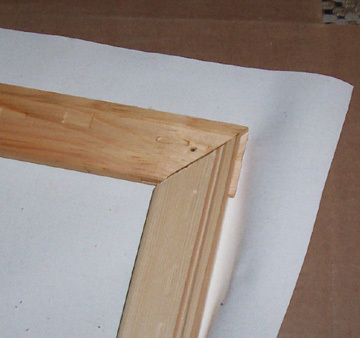 Make sure you start with the gesso'd side away from the wood stretchers; I've done the opposite on accident before. Usually the first couple nails shift the stretchers around as seen in the picture to the right. Don't worry about this while the nail is going in, but make sure it is all straight prior to starting a nail. Picture to right shows 1 nail in each side and a diamond pattern can be seen on the top. If my grandfather were here he'd say "you do good work." Pick a side to start and put in 2 more nails - about 3 inches on either side of the first. See picture. Do this on all sides. You will notice the diamond pattern getting larger on the top side. Don't just nail in all the nails on one side and try to skip rotating the canvas. Here is picture of 3 nails on each side. Be sure to check the stretchers to make sure they aren't slipping. They will slip all the way up to the end. Go ahead and continue using the 2.5-3 inch spacing and put in more nails. 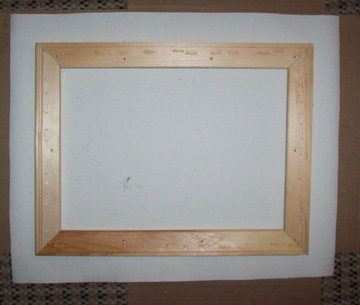 If the canvas is small you are almost done, but if its very large you'll have to keep rotating every 2 - 4 nails per side. 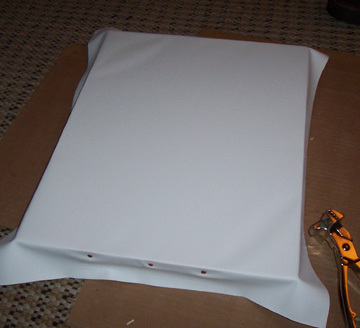 The top of the canvas should look nice and flat. Inbetween each nail put in another. I just start on one side and continue all the way around without much concern for order. Stretching pressure is important; you want to be consistent with the pressure you used initially so the edges stay consistently tight. Don't flex on it. 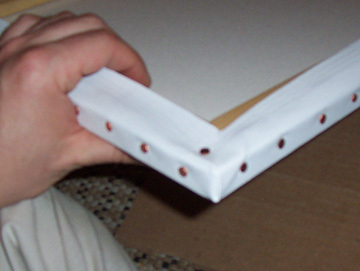 There are several ways to do the edges that don't require cutting. See the pictures and play with it a bit until you get the fold over correct. 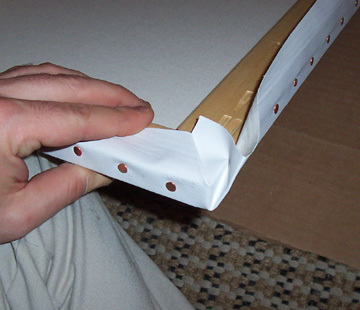 You can fold it under and not use an additional nail. Fold over the edge and make sure you are consistent with the side you decide on... long end or short end. 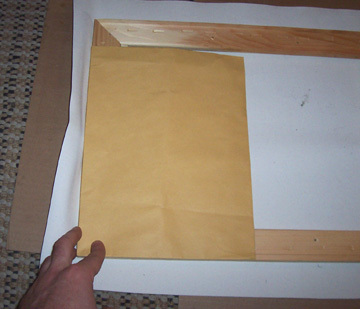 Its going to add a little to the size of the opening the canvas will fit in. 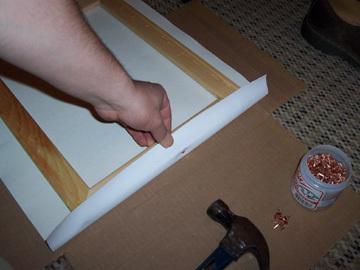 With your fingers pull the corner up and nail it in. 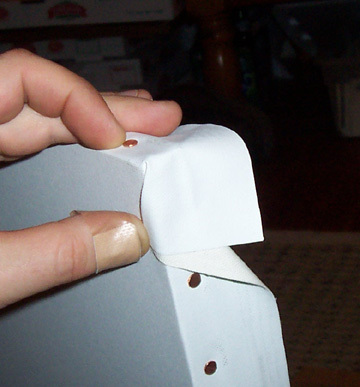 Make sure its tight so your corners don't bubble out.